Japan will post fourth quarter GDP numbers on Thursday (23:50 GMT, Wednesday) with growth expected to have partially recovered from a third quarter contraction. But with global growth decelerating at a worrying rate and the sales tax in Japan due to rise in October, a modest rebound at the end of 2018 is unlikely to diminish the risk of more negative quarters to come in 2019. A rebound in business spending and private consumption is expected to have lifted Japanese growth in the December quarter. Capital expenditure had plunged by 2.8% q/q in the third quarter, while domestic consumption was subdued, falling by 0.2% q/q. Businesses likely upped their expenditure by 1.8% q/q in Q4 and consumer spending is expected to have picked up by 0.8% q/q. 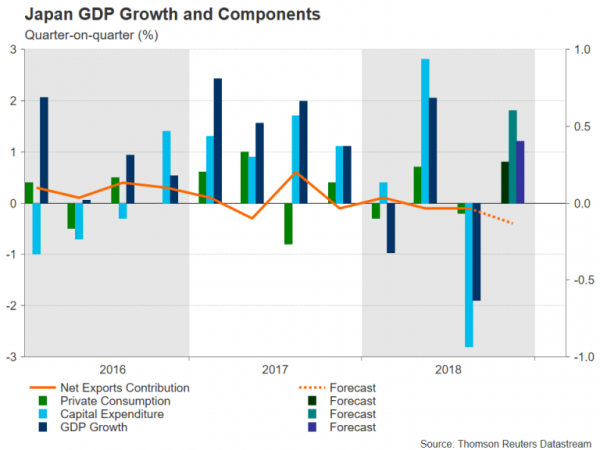 However, the deteriorating global trade environment probably acted as a drag on growth for a third consecutive quarter, with analysts predicting that net exports subtracted 0.4% from GDP growth in Q4. Overall, the economy is expected to have increased by 1.4% on an annualized basis in the three months to December, improving on Q3’s 2.5% drop. On a quarterly basis, growth is projected at 0.4% compared with a 0.6% contraction in the prior period. The data is unlikely to have a major impact on monetary policy so little reaction is being anticipated in forex markets. The yen could firm slightly if there is an upside surprise to the headline GDP figure or there are positive aspects in the breakdown numbers such as stronger-than-expected consumer spending. Initial support for dollar/yen in the event of a boost to the Japanese currency could come at the 110 level, where the 50-period moving average (MA) is currently positioned in the 4-hour chart. This has also been an important support and resistance barrier in the past. A breach of this support would open the way for the 109.60 area, which is the 50% Fibonacci retracement of the downslide from 114.20 to 104.96. Lower down, prices could stall near the 200-period MA at 109.20. If, however, the data misses the consensus forecasts and doubts are raised about Japan’s economic momentum, dollar/yen could extend its February uptrend, though it would first need to overcome resistance at the 61.8% Fibonacci retracement around 110.67. A daily close above this level would bring the 111.45 resistance region into range before traders turn their sights onto the 78.6% Fibonacci around 112.20. After inflation turned lower in Q4, the Bank of Japan is not about to pull the plug on its massive stimulus program anytime soon even if growth bounced back more strongly than anticipated. On the other hand, a disappointing reading would only reinforce the BoJ’s commitment to sticking with its ultra-loose policy until inflation has reached 2%. The Bank’s targeted price gauge, CPI minus fresh foods, moderated to 0.7% year-on-year on December, having reached 1% in September. With trade tensions still running high and the government set to increase the sales tax in October, the downside risks to Japanese growth are substantial, even though the BoJ remains cautiously optimistic about the outlook. The country’s exports slumped by almost 4% in the 12 months to December, as heightened trade uncertainty hit manufacturers globally. There has, however, been some progress in raising wage growth, which edged up to 1.8% y/y in December, though this has yet to significantly lift household spending. Policymakers in Japan will therefore be keeping a close eye on the US-China trade talks as an escalation in trade frictions could potentially tip Japan’s economy into a recession. However, should the US and China achieve a trade settlement in the coming weeks, this would be a double boon for Japanese exporters as it would not only boost global trade but would also lead to a depreciation in the yen as the trade-related risk aversion receded.